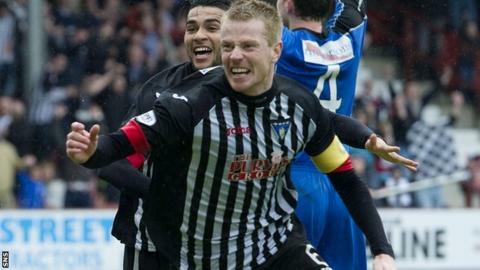 Andy Geggan scored twice as Dunfermline maintained their hopes of promotion to the Championship with victory over Stranraer in the play-off semi-final. With the Pars trailing 2-1 from the first leg, captain Geggan fired home to level the tie just before the hour. With no further scoring in regulation time, extra-time ensued and Geggan headed his side in front in the tie. And Fayssal El-Bakhtaoui's 103rd-minute strike sealed victory for Jim Jefferies' side. Dunfermline, who stuck the goal frame through Geggan and El-Bakhtaoui in the first half, will face Cowdenbeath over two legs with a place in the Championship the prize for the eventual winner. Match ends, Dunfermline Athletic 3, Stranraer 0. Second Half Extra Time ends, Dunfermline Athletic 3, Stranraer 0. Adam Forde (Stranraer) wins a free kick on the right wing. Attempt missed. Andrew Stirling (Stranraer) right footed shot from outside the box is close, but misses to the left. Attempt saved. Stephen Stirling (Stranraer) right footed shot from outside the box is saved in the top centre of the goal. Corner, Stranraer. Conceded by Daniel Grainger. Substitution, Dunfermline Athletic. Shaun Byrne replaces Andrew Geggan because of an injury. Corner, Dunfermline Athletic. Conceded by David MacGregor. Ross Forbes (Dunfermline Athletic) wins a free kick in the attacking half. Second Half Extra Time begins Dunfermline Athletic 3, Stranraer 0. First Half Extra Time ends, Dunfermline Athletic 3, Stranraer 0. Attempt missed. Fayssal El-Bakhtaoui (Dunfermline Athletic) left footed shot from a difficult angle on the left is close, but misses to the left. Goal! Dunfermline Athletic 3, Stranraer 0. Fayssal El-Bakhtaoui (Dunfermline Athletic) right footed shot from the centre of the box to the bottom right corner. Goal! Dunfermline Athletic 2, Stranraer 0. Andrew Geggan (Dunfermline Athletic) header from the centre of the box to the top right corner. Assisted by Daniel Grainger with a cross. Alex Whittle (Dunfermline Athletic) wins a free kick in the defensive half. Attempt missed. Fayssal El-Bakhtaoui (Dunfermline Athletic) right footed shot from outside the box is close, but misses to the left. Andrew Stirling (Stranraer) wins a free kick in the defensive half. Adam Forde (Stranraer) wins a free kick in the defensive half. First Half Extra Time begins Dunfermline Athletic 1, Stranraer 0. Second Half ends, Dunfermline Athletic 1, Stranraer 0. Attempt missed. Daniel Grainger (Dunfermline Athletic) left footed shot from outside the box is high and wide to the left. Attempt saved. Andrew Stirling (Stranraer) right footed shot from outside the box is saved in the centre of the goal. David McKenna (Stranraer) wins a free kick on the left wing.